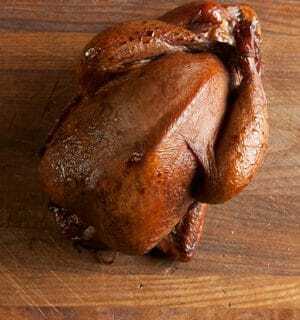 Smoked pheasant can be either the best expression of the bird, or it can be a dessicated husk, usable only as a flavoring for broth. I’ve had it turn out both ways, I am sad to say. After my failures, I got back on the horse and smoked another pheasant. Then another. And another. Finally I am able to present to you a method for smoking pheasants and other upland game birds that works well consistently. The issue with wild birds like pheasants, chukars and grouse is that they work for a living. They can be old and tough, and smoking doesn’t tenderize them. But brining does. Most experienced smokers know that the brining step is important when you deal with fish or other meats. It is vital with pheasants, however. Skip this, or short it, and you will be sorry. I brine my pheasants for at least 12 hours. This is a long time for a bird that typically weighs somewhere between 2 and 3 pounds plucked and gutted. But the salt brine needs time to work its magic. Brines keep meat moister by allowing it to retain more moisture during cooking. All cooking removes moisture from meat, but brined meat loses less. 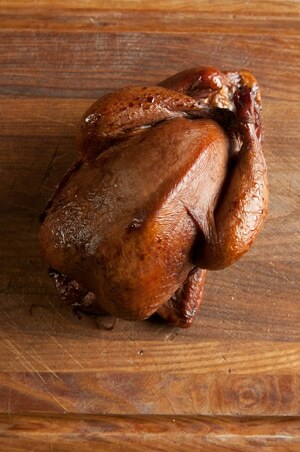 A brined bird is a seasoned bird, too. Brine too little and you get a dry bird. Brine too much and you get a salt lick. 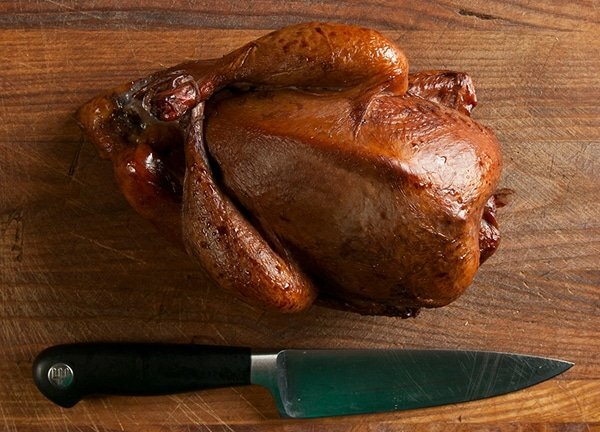 In this case, you want to take the brining process to the edge of “too salty.” And even here, if you are smoking an old rooster, you will probably want to just shred the drumstick meat when you’re done — those sinews are murder. One nerdy trick to a perfect brine? Weigh the pheasant, and the water you intend to brine it in. Do this in grams with a kitchen scale. Then weigh out 2 percent of that total weight in kosher salt, dissolve that in the water, and submerge the pheasant in there for a day or a week. It won’t get too salty. Beyond that, smoking a whole pheasant is pretty easy. Brine, dry, smoke over hardwood. I like a bit of sweet with my smoke, so I use heavy syrup — boiled down maple syrup in this case. You could use molasses, honey, treacle or thick birch, hickory or sorghum syrup. You just want it to be thick, because regular maple syrup will just bead on the surface of the pheasant. If you plan on smoking partridges or grouse, reduce the brining time to 8 to 12 hours (or do the weighing trick I mention above), and keep an eye on your smoking time. You still want an internal temperature in the leg meat of 160°F to 165°F, but it will take less time. And if you don’t plan on eating the legs (or you want to use them as a base for soup) take the birds out when the breast meat hits 150°F. They will be more tender that way. Eat smoked pheasant right off the smoker for dinner, or you can let it cool and slice the breast meat for sandwiches. Gnaw on the thighs for a snack, and shred the drumstick meat for soup, tacos or burritos, in omelets or hash… you get the point. Don’t forget the carcass! use that to make a smokey pheasant broth. This is a hot-smoking method, essentially a really slow, smoky barbecue. Instead of barbecue sauce, which you could of course us if you wanted to, I use maple syrup instead. This creates a nice sweet glaze for the smoke to adhere to as the bird cooks. You must use plucked pheasants for this recipe. 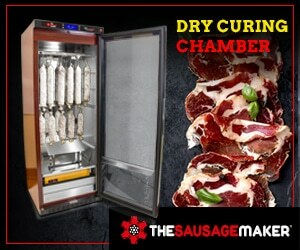 It will not work with skinned birds, as they will get too dry. If you are not a hunter but want to make this, you can use a high-quality domestic chicken (regular supermarket ones are too soft and flabby) or you can buy a whole pheasant online or in some supermarkets. Dissolve the salt and sugar in the water. Find a lidded container just about large enough to hold both pheasants. Cover them with the brine and let this sit in the fridge for at least 12 hours and up to 18 hours. OPTIONAL: Weigh the pheasant and the water you intend to brine it in; you'll have to guess, so err on more water. Now dissolve 2 percent of that total weight -- pheasant + water -- in kosher salt in the water, then brine. This method allows you to brine the bird for days without it getting too salty. Take the pheasants out of the brine. Set on a cooling rack under a ceiling fan or in a breezy place and let them dry for an hour or so. You can also put the birds in a container uncovered in the fridge overnight. This drying process is an important step. You want the bird damp and tacky on the outside, not soaking wet. Smoke the pheasants over the wood of your choice – I prefer apple, hickory or pecan – for at least 3 hours, and up to 5 hours. You want a relatively warm smoke, between 200°F and 250°F. Let the pheasants smoke for 1 hour before painting on the maple syrup, then baste with the syrup every 30 minutes afterward. When the pheasants reach an internal temperature of 160°F in the thigh meat, take them out of the smoker. Put them on a cooling rack and baste them with maple syrup one more time. Wait at least 20 minutes before eating. They are excellent cold, too. Note: This recipe also works with chukars, grouse and partridges, but not turkeys. Use this smoked turkey recipe instead. You’ll find lots of other recipes for smoked meats and fish here on Hunter Angler Gardener Cook! I usually end up with skinned duck and pheasant breasts at the end of the fall hunting seasons. When I buy chicken thighs I routinely skin them before cooking. 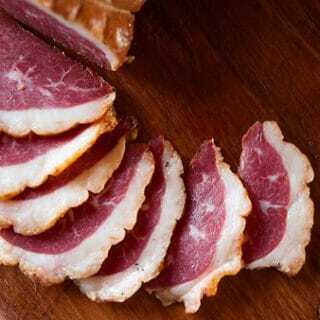 I roll up the skins and freeze them in ziplock bags- and use the skins to cover wild pheasant and duck breasts before roasting or smoking… less fat than bacon, and it does not impart a bacon flavor. Helps keep them moist. 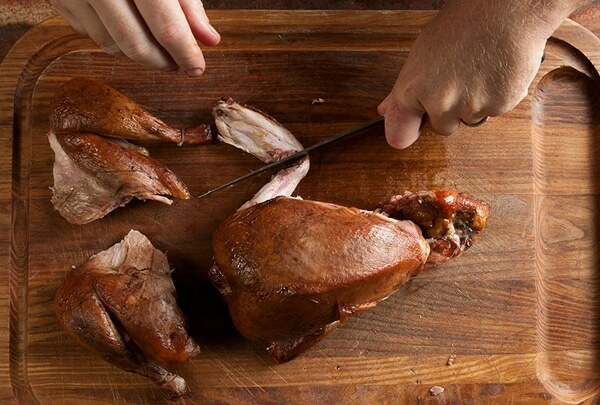 This recipe has become my go to smoked game bird primer. It is adaptable and so easy to follow. You will automatically get good results.